She was a 1,914 GRT steam cargo ship that was sunk on 12 April 1943 by torpedoes fired by German submarine U-404 at position 50° 18' N, 42° 48' W.
Frederick Arthur	 Bailey	 18	 11/04/1943	 Fireman and Trimmer	 Merchant Navy	 United Kingdom	 Tower Hill Memorial	 Panel 63. Age 18. Son of Martha Bailey of Longton Stoke-on-Trent. Kenneth William	 Benson	 25	 11/04/1943	 Third Engineer Officer	 Merchant Navy	 United Kingdom	 Tower Hill Memorial	 Panel 63. Age 25. Son of William and Annie Benson; husband of Elizabeth Eleanor Benson of Barrow-in-Furness Lancashire. George Arthur	 Brocklesby	 25	 11/04/1943	 Fireman and Trimmer	 Merchant Navy	 United Kingdom	 Tower Hill Memorial	 Panel 63. Age 25. Son of George and Dorothy Brocklesby; husband of Clara Brocklesby of Grimsby Lincolnshire. Eric Gordon	 Carter	 33	 11/04/1943	 Able Seaman	 Merchant Navy	 United Kingdom	 Tower Hill Memorial	 Panel 63. Age 33. Son of Frederick Gordon Carter and Jessie Lilian Carter of Northam Devon; husband of Florence Dena Holbrook Carter of New York City U.S.A.
Cecil George	 Clench	 25	 11/04/1943	 Second Engineer Officer	 Merchant Navy	 United Kingdom	 Tower Hill Memorial	 Panel 63. Age 25. Son of David George and Dorothy Flora Clench of Bitterne Park Southampton. George	 Colaluca	 19	 11/04/1943	 Fireman and Trimmer	 Merchant Navy	 United Kingdom	 Tower Hill Memorial	 Panel 63. Age 19. Son of Mrs. R. Colaluca of Deptford London. Frederick	 Cole	 32	 11/04/1943	 Cook	 Merchant Navy	 United Kingdom	 Tower Hill Memorial	 Panel 63. Age 32. Son of Frederick and Mary Ann Cole. Vivian Kenneth	 Corcoran	 20	 11/04/1943	 Fireman and Trimmer	 Merchant Navy	 United Kingdom	 Tower Hill Memorial	 Panel 63. Age 20. Son of Charles Henry and Mary Louisa Corcoran of Cardiff. Charles Henry	 Cummings	 40	 11/04/1943	 Chief Steward	 Merchant Navy	 United Kingdom	 Tower Hill Memorial	 Panel 63. Age 40. Son of Alexander and Mary A. E. S. Cummings; husband of Victoria Cummings of New York City U.S.A.
Carmelo	 Debona	 30	 11/04/1943	 Able Seaman	 Merchant Navy	 United Kingdom	 Tower Hill Memorial	 Panel 63. Age 30. Son of Joseph and Catharone Debona; husband of Rose Debona of Xewkija Gozo Malta G.C. Edward George	 Dybell	 22	 11/04/1943	 Able Seaman	 Merchant Navy	 United Kingdom	 Tower Hill Memorial	 Panel 63. Age 22. Son of Edward and Elizabeth Dybell of Liverpool. Frederick Randell	 Elliott	 48	 11/04/1943	 Master	 Merchant Navy	 United Kingdom	 Tower Hill Memorial	 Panel 63. Age 48. Husband of Ellen P. Elliott of Northwood Middlesex. Harold Hellier	 Evans	 34	 11/04/1943	 First Radio Officer	 Merchant Navy	 United Kingdom	 Tower Hill Memorial	 Panel 63. Age 34. Son of William and Agnes Evans; husband of Ursula Evans of North Marston Buckinghamshire. Francis William	 Gardiner	 22	 11/04/1943	 Third Officer	 Merchant Navy	 United Kingdom	 Tower Hill Memorial	 Panel 63. Age 22. Son of William and Dora Gardiner of Walton-on-the-Naze Essex. Thomas James	 Gough	 22	 11/04/1943	 Steward	 Merchant Navy	 United Kingdom	 Tower Hill Memorial	 Panel 63. Age 22. Son of Mark and Beatrice May Gough of Twickenham Middlesex. John	 Grima	 24	 11/04/1943	 Able Seaman	 Merchant Navy	 United Kingdom	 Tower Hill Memorial	 Panel 63. Age 24. Son of Francis and Assunta Grima of Nadur Gozo Malta G.C. Leslie Cooper	 Jones	 27	 11/04/1943	 Fourth Engineer Officer	 Merchant Navy	 United Kingdom	 Tower Hill Memorial	 Panel 63. Age 27. Son of Henry and Alice Jones; husband of Dorothy Jones of Witton Birmingham. 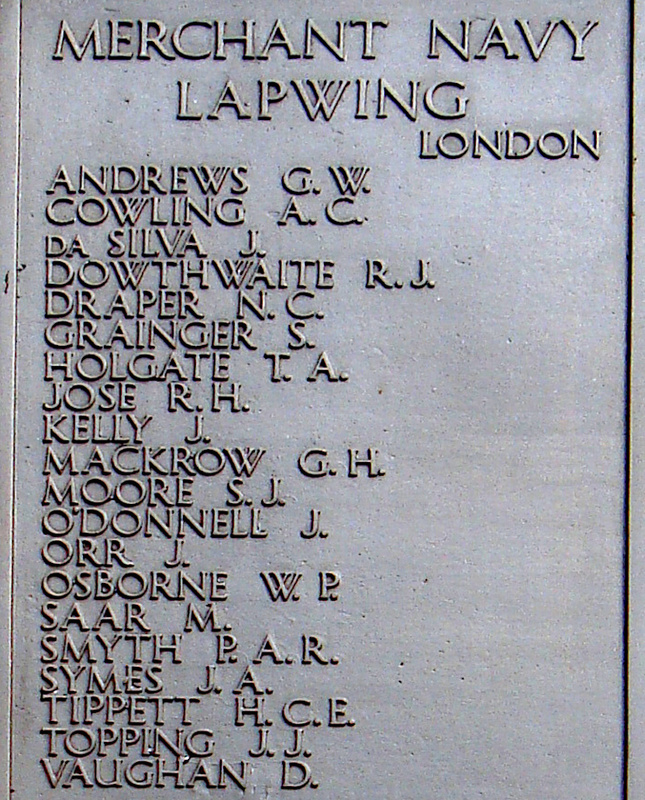 Albert Edmund Morris	 Long	 18	 11/04/1943	 Donkeyman	 Merchant Navy	 United Kingdom	 Tower Hill Memorial	 Panel 63. Age 18. Son of Alwyn Morris Long and Mary Long of Porthcawl Glamorgan. John Robert	 Middleton	 33	 11/04/1943	 Donkeyman	 Merchant Navy	 United Kingdom	 Tower Hill Memorial	 Panel 63. Age 33. Son of Joseph and Mary Middleton. Ian	 Mckinnell	 26	 11/04/1943	 Second Officer	 Merchant Navy	 United Kingdom	 Tower Hill Memorial	 Panel 63. Age 26. Son of Frederick James McKinnell and Lucy Mary McKinnell; husband of Nina Maud McKinnell of Bexhill-on-Sea Sussex. William	 Obrien, M M and Bar	 45	 11/04/1943	 Fireman and Trimmer	 Merchant Navy	 United Kingdom	 Tower Hill Memorial	 Panel 63. Age 45. Son of William and Anne OBrien; husband of Elizabeth OBrien of Northenden Manchester. William Clifford	 Scarratt	 40	 11/04/1943	 Able Seaman	 Merchant Navy	 United Kingdom	 Tower Hill Memorial	 Panel 63. Age 40. Husband of Hilda Scarratt of Padfield Derbyshire. Thomas Percy	 Stratton	 17	 11/04/1943	 Pantry Boy	 Merchant Navy	 United Kingdom	 Tower Hill Memorial	 Panel 63. Age 17. Son of Percy Henry and Kate Victoria Stratton of Waterford Lymington Hampshire. Joseph	 Sultana	 36	 11/04/1943	 Able Seaman	 Merchant Navy	 United Kingdom	 Tower Hill Memorial	 Panel 63. Age 36. Son of Francis and Mary Sultana; husband of Paula Sultana of Ghajnsielem Gozo Malta G.C. Stanley	 Taylor	 40	 11/04/1943	 Chief Engineer Officer	 Merchant Navy	 United Kingdom	 Tower Hill Memorial	 Panel 63. Age 40. Son of John and Emily Taylor. Daniel Frank Bennett	 Tedham	 11/04/1943	 Fireman and Trimmer	 Canadian Merchant Navy	 Canada	 Halifax Memorial	 Panel 23. Michael Duncan	 Thomas	 21	 11/04/1943	 Able Seaman	 Merchant Navy	 United Kingdom	 Tower Hill Memorial	 Panel 63. Age 21. Son of Robert Duncan Thomas and Nora Winifred Thomas of Porthcawl Glamorgan. She was a 4,622 GRT steam cargo ship that was sunk on 14 February 1940 by a torpedo fired by German submarine U-26 at position 51° 40' N, 12° 40' W. In 1939 had been in collision with Mervyn. There were no deaths on Langleeford although there were on the other vessel - see the entry HERE. Thomas	 Anning	 49	 17/02/1940	 Cook	 Merchant Navy	 United Kingdom	 Tower Hill Memorial	 Panel 63. Age 49. Son of William and Mary Jane Anning. Salvador	 Pulis	 62	 16/02/1940	 Fireman and Trimmer	 Merchant Navy	 United Kingdom	 Tower Hill Memorial	 Panel 63. Age 62. Son of Joseph and Grazia Pulis; husband of Vincenza Pulis (nee Camilleri) of Paula Malta G.C. She was a 4,524 GRT steam cargo ship that was sunk on 23 January 1941 by aircraft bombing at position 53° 19' N, 13° 11' W.
Harold Sebastian	 Bird	 25	 23/01/1941	 Ordinary Seaman	 Merchant Navy	 United Kingdom	 Tower Hill Memorial	 Panel 63. Age 25. Son of William and Teresa Bird; husband of Monica Josephine Bird of Wicklow Irish Republic. William Joseph	 Brinton	 29	 23/01/1941	 Able Seaman	 Canadian Merchant Navy	 Canada	 Halifax Memorial	 Panel 19. Age 29. Son of Charles F. Brinton and of Mary Brinton (nee Walsh) of Marystown Placentia Bay Newfoundland. Alexander	 Campbell	 29	 23/01/1941	 Boatswain	 Merchant Navy	 United Kingdom	 Tower Hill Memorial	 Panel 63. Age 29. Son of John and Sarah Campbell of Achateny Argyllshire. 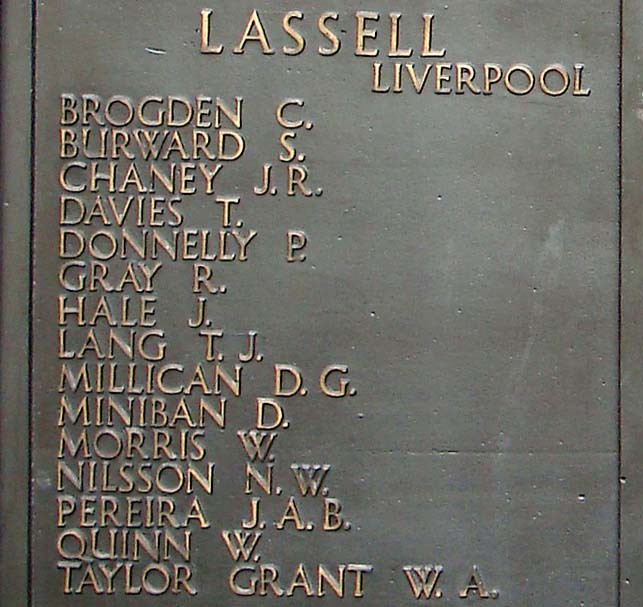 Donald	 Campbell	 30	 23/01/1941	 Fireman and Trimmer	 Merchant Navy	 United Kingdom	 Tower Hill Memorial	 Panel 63. Age 30. Husband of Helen Campbell of Glasgow. Robert Martin	 Currie	 24	 23/01/1941	 Chief Officer	 Merchant Navy	 United Kingdom	 Tower Hill Memorial	 Panel 63. Age 24. Son of Aitken McLaren Currie and Susan Currie. Alfred George	 Driver	 25	 23/01/1941	 Fireman and Trimmer	 Merchant Navy	 United Kingdom	 Tower Hill Memorial	 Panel 63. Age 25. Son of Thomas and Beatrice Driver of Shawforth Lancashire. Robert	 Dunn	 57	 23/01/1941	 Chief Engineer Officer	 Merchant Navy	 United Kingdom	 Tower Hill Memorial	 Panel 63. Age 57. Son of Mr. and Mrs. David Dunn of Belfast Northern Ireland; husband of Esther L. Dunn of Fulwell Sunderland Co. Durham. James	 Elliott	 15	 23/01/1941	 Mess Room Boy	 Merchant Navy	 United Kingdom	 Tower Hill Memorial	 Panel 63. Age 15. Son of James and Jane Thomson Elliott. Peter	 Gray	 23	 23/01/1941	 Sailor	 Merchant Navy	 United Kingdom	 Tower Hill Memorial	 Panel 63. Age 23. Son of Peter and Christina Gray. John	 Hogg	 27	 23/01/1941	 Fourth Engineer Officer	 Merchant Navy	 United Kingdom	 Tower Hill Memorial	 Panel 63. Age 27. Husband of Dorothy Jane Hogg of Heaton Newcastle-on-Tyne. George Race	 Hutchinson	 18	 23/01/1941	 Apprentice	 Merchant Navy	 United Kingdom	 Tower Hill Memorial	 Panel 63. Age 18. Son of Charles and Margaret Hutchinson of Whitburn Co. Durham. Thomas Ismay	 Jones	 48	 23/01/1941	 Carpenter	 Merchant Navy	 United Kingdom	 Tower Hill Memorial	 Panel 63. Age 48. Son of Thomas Ismay Jones and Rose Gwenneth Jones; husband of Judith Mary Jones of Liverpool. Francis Joseph	 Keegan	 26	 23/01/1941	 Fireman and Trimmer	 Merchant Navy	 United Kingdom	 Tower Hill Memorial	 Panel 63. Age 26. Son of John Keegan and of Ellen Keegan (nee Small); husband of Letitia Keegan of Blantyre Lanarkshire. Eric	 Keen	 22	 23/01/1941	 Third Officer	 Merchant Navy	 United Kingdom	 Tower Hill Memorial	 Panel 63. Age 22. Son of Thomas Keen and of Annie I. Keen of Holystone Northumberland. James W.	 Mallay	 23/01/1941	 Sailor	 Canadian Merchant Navy	 Canada	 Halifax Memorial	 Panel 19. Son of Mr. and Mrs. E. Mallay of Marystown Placentia Bay Newfoundland. David	 Mole	 19	 23/01/1941	 Apprentice	 Merchant Navy	 United Kingdom	 Tower Hill Memorial	 Panel 63. Age 19. Son of Edward and Kathleen Mole. Murdo James	 Maclennan	 20	 23/01/1941	 Second Radio Officer	 Merchant Navy	 United Kingdom	 Tower Hill Memorial	 Panel 63. Age 20. Son of Donald and Isabella Ann MacLennan of Broadford Isle of Skye. Robert	 Nolan	 21	 23/01/1941	 Able Seaman	 Canadian Merchant Navy	 Canada	 Halifax Memorial	 Panel 19. Age 21. Son of Mr. and Mrs. Vincent Nolan of Marystown Placentia Bay Newfoundland. Peter	 Ohara	 35	 23/01/1941	 Galley Boy	 Merchant Navy	 United Kingdom	 Tower Hill Memorial	 Panel 63. Age 35. Son of James and Sarah OHara of Glasgow; husband of Jessie OHara of Glasgow. Patrick B. Power	 21	 23/01/1941	 Able Seaman	 Canadian Merchant Navy	 Canada	 Halifax Memorial	 Panel 19. Age 21. Son of Francis and Adela Power of Marystown Placentia Bay Newfoundland. Patrick	 Prior	 56	 23/01/1941	 Fireman and Trimmer	 Merchant Navy	 United Kingdom	 Tower Hill Memorial	 Panel 63. Age 56. Son of Patrick and Cathrine Prior; husband of Agnes Prior of Bridgeton Glasgow. Godefridus Hubertus	 Roelofs	 52	 23/01/1941	 Cook	 Merchant Navy	 United Kingdom	 Tower Hill Memorial	 Panel 63. Age 52. Son of Johannes Franciscus Roelofs and Lucia Catharina Herbertina Roelofs; husband of Hortentia Roelofs of Antwerp Belgium. Robert Arthur William	 Swift	 29	 23/01/1941	 First Radio Officer	 Merchant Navy	 United Kingdom	 Tower Hill Memorial	 Panel 63. Age 29. Son of Charles William and Emmie Swift of Palmers Green Middlesex. His brother Volunteer Earle Cyril Clarence Swift died in the United Kingdom. Charles Stansfield	 Wallace	 20	 23/01/1941	 Cabin Boy	 Merchant Navy	 United Kingdom	 Tower Hill Memorial	 Panel 63. Age 20. Son of Charles G. and Jessie Nicol Wallace of Glasgow. Charles Evans	 Walton	 50	 23/01/1941	 Third Engineer Officer	 Merchant Navy	 United Kingdom	 Tower Hill Memorial	 Panel 63. Age 50. Son of Charles Evans Walton and Mary Alice Walton; husband of Margaret Walton of South Shields Co. Durham. Gordon	 Young	 39	 23/01/1941	 Fireman and Trimmer	 Merchant Navy	 United Kingdom	 Tower Hill Memorial	 Panel 63. Age 39. Son of Gilbert and Christina Young; husband of Joan Young of Glasgow. She was a 4,908 GRT steam cargo ship that survived the war. She was damaged on 18 November 1940 by aircraft bombing in the Thames Estuary. Laurence	 Smith	 42	 20/07/1941	 Master	 Merchant Navy	 United Kingdom	 Tower Hill Memorial	 Panel 63. Age 42. Son of John E. and A. G. Smith; husband of Sylvia Smith of Whitby Yorkshire. She was a 1,449 GRT steam cargo ship that was sunk on 26 September 1941 by torpedoes fired by German submarine U-203 at position 47° 40' N, 23° 30' W. At the time of sinking, Lapwing had been rescuing survivors of Petrel - see entry HERE and Cortes - seen entry HERE. Ultimately only nine crew members from Lapwing and nine from Petrel survived. Arthur Cyril	 Cowling	 34	 26/09/1941	 Second Officer	 Merchant Navy	 United Kingdom	 Tower Hill Memorial	 Panel 64. Age 34. Son of Thomas Arthur and Myra Cowling; husband of Kathleen Cowling of Grimsby Lincolnshire. Joseph	 Da Silva	 18	 26/09/1941	 Stewards Boy	 Merchant Navy	 United Kingdom	 Tower Hill Memorial	 Panel 64. Age 18. Son of Manuel and Rosa da Silva of Funchal Madeira. 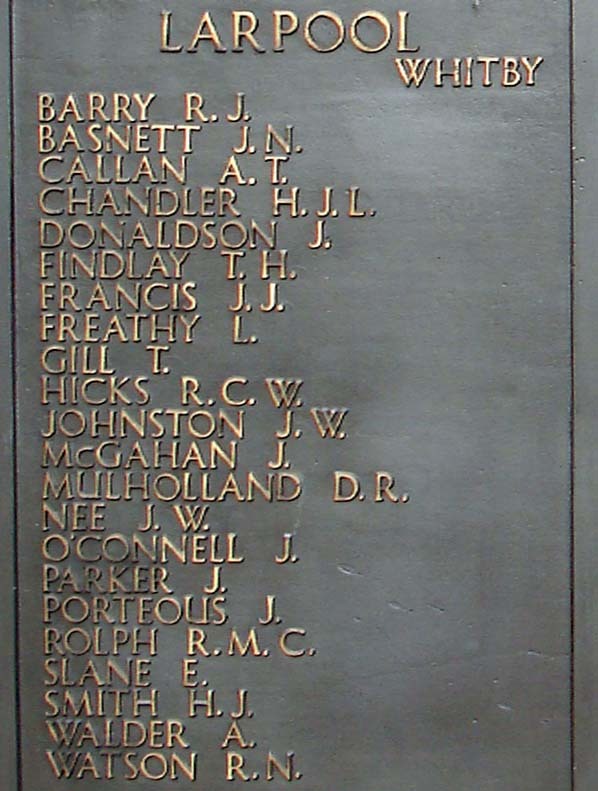 Ronald James	 Douthwaite	 16	 26/09/1941	 Boy	 Merchant Navy	 United Kingdom	 Tower Hill Memorial	 Panel 64. Age 16. Son of Frederick Joseph and Sarah Elizabeth Douthwaite of Currock Carlisle. Norman Christopher	 Draper	 38	 26/09/1941	 Greaser	 Merchant Navy	 United Kingdom	 Tower Hill Memorial	 Panel 64. Age 38. Son of Joseph Henry and Louie Draper; husband of Agnes Grace Draper of Chelston Torquay Devon. Stanley	 Grainger	 19	 26/09/1941	 Fireman and Trimmer	 Merchant Navy	 United Kingdom	 Tower Hill Memorial	 Panel 64. Age 19. Son of Mr. and Mrs. Charles Grainger of Kirkdale Liverpool. Thomas Albert	 Holgate	 39	 26/09/1941	 Boatswain	 Merchant Navy	 United Kingdom	 Tower Hill Memorial	 Panel 64. Age 39. Son of Joseph Frederick and Selina Ann Talbot Holgate; husband of Olive Ellen Frances Holgate of Bexleyheath Kent. Thomas James	 Hyam	 40	 26/09/1941	 Master	 Merchant Navy	 United Kingdom	 Tower Hill Memorial	 Panel 63. Age 40. Son of Charles and Louisa Hyam; husband of Iris Josephine Hyam of Porthcawl Glamorgan. Robert Henry	 Jose	 20	 26/09/1941	 Ordinary Seaman	 Merchant Navy	 United Kingdom	 Tower Hill Memorial	 Panel 64. Age 20. Son of Frank L. and Lena M. Jose of Cardiff. George Hatton	 Mackrow	 55	 26/09/1941	 Second Engineer Officer	 Merchant Navy	 United Kingdom	 Tower Hill Memorial	 Panel 64. Age 55. Son of George Frank and Florence Anne Mackrow; husband of Mary Joyce Mackrow of Coseley Shropshire. Stephen James	 Moore	 50	 26/09/1941	 Chief Steward	 Merchant Navy	 United Kingdom	 Tower Hill Memorial	 Panel 64. Age 50. Son of Stephen James Moore and Louisa Moore; husband of Florence Gertrude Moore. John	 Odonnell	 18	 26/09/1941	 Fireman and Trimmer	 Merchant Navy	 United Kingdom	 Tower Hill Memorial	 Panel 64. Age 18. Son of Peter ODonnell and of Ada ODonnell of Liverpool. John	 Orr	 48	 26/09/1941	 Chief Engineer Officer	 Merchant Navy	 United Kingdom	 Tower Hill Memorial	 Panel 64. Age 48. Son of Thomas and Susan Orr; husband of Margaret Orr Orr of Sidcup Kent. William Percy	 Osborne	 41	 26/09/1941	 First Radio Officer	 Merchant Navy	 United Kingdom	 Tower Hill Memorial	 Panel 64. Age 41. Son of William and Charlotte Osborne; husband of Doris Millicent Osborne of Biggleswade Bedfordshire. Percy Alexander Richard	 Smyth	 20	 26/09/1941	 Third Engineer Officer	 Merchant Navy	 United Kingdom	 Tower Hill Memorial	 Panel 64. Age 20. Son of William Charles and Ethel Smyth of Forest Gate Essex. Joseph Anthony	 Symes	 25	 26/09/1941	 Fireman and Trimmer	 Merchant Navy	 United Kingdom	 Tower Hill Memorial	 Panel 64. Age 25. Husband of Margaret Symes of Bootle Lancashire. John Joseph	 Topping	 36	 26/09/1941	 Fireman and Trimmer	 Merchant Navy	 United Kingdom	 Tower Hill Memorial	 Panel 64. Age 36. Son of Frances Topping; stepson of Daniel Brown. She was a 5,150 GRT motor cargo ship that was sunk on 9 September 1943 by torpedoes fired by Japanese submarine I-27 at position 07° 38' N, 74° 00' E. She was en route from Baltimore to Calcutta with a general cargo and military stores including 4 tanks, amphibious craft and railway iron. The vessel sank within 2 minutes and survivors were picked up by Tahania and US ship Panaman. 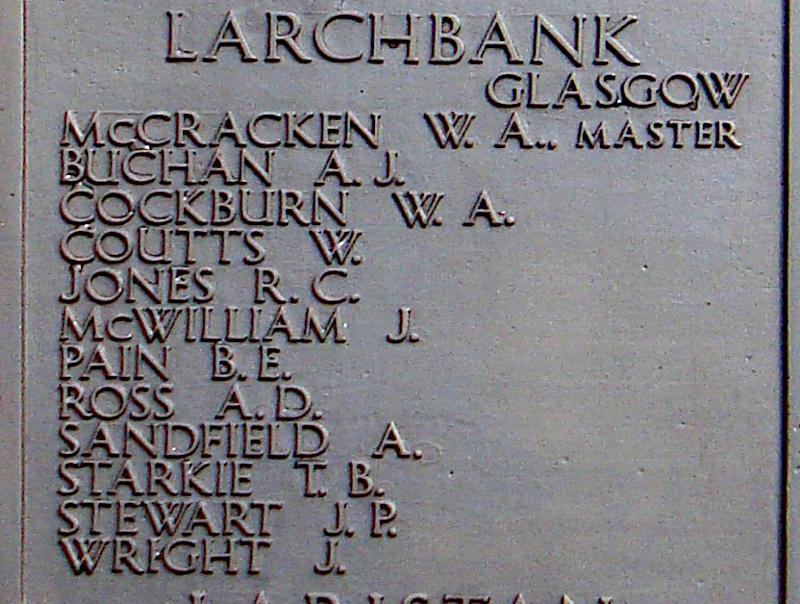 Alick James	 Buchan	 23	 09/09/1943	 Third Officer	 Merchant Navy	 United Kingdom	 Tower Hill Memorial	 Panel 64. Age 23. Son of Joseph and Ann Buchan of Peterhead Aberdeenshire. William	 Coutts	 30	 09/09/1943	 Carpenter	 Merchant Navy	 United Kingdom	 Tower Hill Memorial	 Panel 64. Age 30. Son of Alexander P. Coutts and of Olivia Coutts of Crosshill Glasgow. Richard Cornet	 Jones	 25	 09/09/1943	 Second Officer	 Merchant Navy	 United Kingdom	 Tower Hill Memorial	 Panel 64. Age 25. Son of Llewelyn Richard Jones and of Marion Jones (nee Cornet). William Arthur	 Mccracken	 42	 09/09/1943	 Master	 Merchant Navy	 United Kingdom	 Tower Hill Memorial	 Panel 64. Age 42. Son of James and Christine McCracken; husband of Emily Olga McCracken of South Shields Co. Durham. Alexander Donald	 Ross	 37	 09/09/1943	 Chief Officer	 Merchant Navy	 United Kingdom	 Tower Hill Memorial	 Panel 64. Age 37. Son of Donald and Catherine Ross; husband of Jessie Ross of North Erradale Ross and Cromarty. Albert	 Sandfield	 29	 09/09/1943	 Third Engineer Officer	 Merchant Navy	 United Kingdom	 Tower Hill Memorial	 Panel 64. Age 29. Son of George Sandfield and of Florence Sandfield of Chelmsford Essex. Thomas Bell	 Starkie	 23	 09/09/1943	 Second Engineer Officer	 Merchant Navy	 United Kingdom	 Tower Hill Memorial	 Panel 64. Age 23. Son of Lieut. H. H. Starkie R.N. and Isobella S. Starkie of Kinmel Bay Rhyl Flintshire. John Paul	 Stewart	 18	 09/09/1943	 Apprentice	 Merchant Navy	 United Kingdom	 Tower Hill Memorial	 Panel 64. Age 18. Son of Percy Douglas Stewart and Josephine Stewart of Liverpool. She was a 6,417 GRT steam tanker that survived the war. According to the CWGC database, the Date of Death of Mr. Woodrow was 3 July 1941. Information on how he lost his life can be found on the Queries and Omissions page under 'Queries' HERE. John	 Woodrow	 56	 03/07/1941	 Second Engineer Officer	 Merchant Navy	 United Kingdom	 Tower Hill Memorial	 Panel 64. Age 56. Son of William Erskine Woodrow and Louisa Woodrow; husband of Ethel Mary Woodrow of South Shields Co. Durham. She was a 3,872 GRT steam cargo ship that was sunk on 2 November 1941 by torpedoes fired by German submarine U-208 at a position 250 East South East of Cape Race. Herbert James Lindredge	 Chandler	 21	 02/11/1941	 Sailor	 Merchant Navy	 United Kingdom	 Tower Hill Memorial	 Panel 64. Age 21. Son of Alexander James Lindredge Chandler and Alice Maud Chandler. James	 Donaldson	 35	 02/11/1941	 Steward	 Merchant Navy	 United Kingdom	 Tower Hill Memorial	 Panel 64. Age 35. Son of John and Elizabeth Smith of Edinburgh. Thomas Henry	 Findlay	 17	 02/11/1941	 Apprentice	 Merchant Navy	 United Kingdom	 Tower Hill Memorial	 Panel 64. Age 17. Son of Mrs. H. J. Findlay of Hull. John James	 Francis	 27	 02/11/1941	 First Radio Officer	 Merchant Navy	 United Kingdom	 Tower Hill Memorial	 Panel 64. Age 27. Nephew of Elizabeth Francis of Boscombe Hampshire. Lenard	 Freathy	 16	 02/11/1941	 Ordinary Seaman	 Merchant Navy	 United Kingdom	 Tower Hill Memorial	 Panel 64. Age 16. Son of Albert and Maud Mary Freathy of Hornchurch Essex. His brother Frederick William Freathy also fell. Terence	 Gill	 17	 02/11/1941	 Galley Boy	 Merchant Navy	 United Kingdom	 Tower Hill Memorial	 Panel 64. Age 17. Son of Timothy and Sarah Gill of Whitby Yorkshire. James Haldane Mcdonald	 Harrower	 25	 14/11/1941	 Second Radio Officer	 Merchant Navy	 Canada	 Halifax (Camp Hill) Cemetery	 Sec. S. Div. 2. Grave 47 East. Age 25. Son of David and Euphemia Harrower of Edinburgh Scotland. 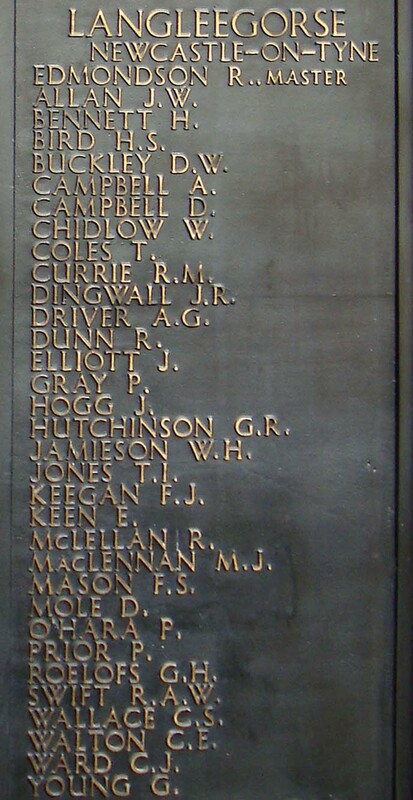 Reginald Cecil William	 Hicks	 16	 11/11/1941	 Apprentice	 Merchant Navy	 United Kingdom	 Tower Hill Memorial	 Panel 104. Age 16. Son of Cecil F. and Elizabeth Hicks. John William	 Johnston	 21	 02/11/1941	 Carpenter	 Merchant Navy	 United Kingdom	 Tower Hill Memorial	 Panel 64. Age 21. Son of James Park Johnston and Elizabeth Johnston of St. Marys Holm Orkney. David Ritchie	 Mulholland	 20	 02/11/1941	 Second Officer	 Merchant Navy	 United Kingdom	 Tower Hill Memorial	 Panel 64. Age 20. Son of Andrew Gemmell Mulholland and Margaret Mulholland of Newcastle Staffordshire. Joseph	 Mcgahan	 34	 02/11/1941	 Fireman	 Merchant Navy	 United Kingdom	 Tower Hill Memorial	 Panel 64. Age 34. Son of Joseph and Margaret McGahan; husband of Rose McGahan of Edinburgh. John William	 Nee	 22	 02/11/1941	 Fireman and Trimmer	 Merchant Navy	 United Kingdom	 Tower Hill Memorial	 Panel 64. Age 22. Son of Mary Kee of Primrose Jarrow Co. Durham. James	 Oconnell	 53	 02/11/1941	 Third Engineer Officer	 Merchant Navy	 United Kingdom	 Tower Hill Memorial	 Panel 64. Age 53. Son of Michael and Essie OConnell; husband of Helen OConnell of Hill Cove Co. Cork Irish Republic. James	 Parker	 40	 02/11/1941	 Able Seaman	 Merchant Navy	 United Kingdom	 Tower Hill Memorial	 Panel 64. Age 40. Husband of A. Parker of West View Hartlepool Co Durham. John	 Porteous	 56	 02/11/1941	 Greaser	 Merchant Navy	 United Kingdom	 Tower Hill Memorial	 Panel 64. Age 56. Son of Robert and Jessie Porteous. Reginald Maurice Cecil	 Rolph	 18	 02/11/1941	 Cabin Boy	 Merchant Navy	 United Kingdom	 Tower Hill Memorial	 Panel 64. Age 18. Son of Cecil Edward and Nellie Gladys Rolph of Portslade Sussex. Edward	 Slane	 30	 02/11/1941	 Fireman and Trimmer	 Merchant Navy	 United Kingdom	 Tower Hill Memorial	 Panel 64. Age 30. Son of James Slane and of Elizabeth Slane of Port Chalmers Otago New Zealand. Robert Norman	 Watson	 50	 02/11/1941	 Chief Engineer Officer	 Merchant Navy	 United Kingdom	 Tower Hill Memorial	 Panel 64. Age 50. Husband of Eugenie Watson of Lowestoft Suffolk. She was a 1,807 GRT steam cargo ship that was destroyed on 2 December 1943 during a bombing raid on Bari. See the entry for Fort Athabaska HERE. John	 Clarke	 17	 08/12/1943	 Galley Boy	 Merchant Navy	 Italy	 Bari War Cemetery	 XIV. B. 14. Age 17. Son of John and Agnes Clarke of Hull. Frode Julius	 Jensen	 35	 22/12/1943	 Fireman	 Merchant Navy	 Italy	 Bari War Cemetery	 VI. E. 7. Age 35. Son of Frode Julius and Helen Hansen Jensen; husband of Maisie Jensen of Grangemouth Stirlingshire. Harry Evert	 Lagerstrom	 30	 09/12/1943	 Fireman and Trimmer	 Merchant Navy	 Italy	 Bari War Cemetery	 X. E. 32. Age 30. Son of Anton August Lagerstrom and Selma Gustava Lagerstrom of Turku Finland. Thomas William	 Mcloughlin	 18	 04/12/1943	 Mess Room Boy	 Merchant Navy	 Italy	 Bari War Cemetery	 XIV. B. 20. Age 18. Son of George William McLoughlin and of Ann McLoughlin of Hull. Knud Henning	 Nielsen	 19	 21/12/1943	 Able Seaman	 Merchant Navy	 Italy	 Bari War Cemetery	 VI. E. 5. Age 19. Son of Mr. and Mrs. Arnold Nielsen; husband of Joan Nielsen of Newcastle-on-Tyne. Juho Heikiu	 Timo	 49	 02/12/1943	 Fireman and Trimmer	 Merchant Navy	 United Kingdom	 Tower Hill Memorial	 Panel 64. Age 49. Son of Heikki and Elisabet Timo. Johannes Wilhelm	 Wildt	 33	 02/12/1943	 First Radio Officer	 Merchant Navy	 United Kingdom	 Tower Hill Memorial	 Panel 64. Age 33. Son of Ernest and Susanne Wildt of Charlottenlund Denmark; husband of Mimi Wildt of Freerslevgaard Brodeskov Denmark. She was a 7,417 GRT motor cargo ship that was sunk on 30 April 1941 by a torpedo fired by German submarine U-107 at position 12° 55' N, 28° 56' W. Many of the survivors, including the Master Alfred Bibby, were picked up by Benvrackie - see entry HERE - which was sunk four days later by U-105 - those killed included 15 Lassell survivors. Patrick	 Donnelly	 30	 13/05/1941	 Able Seaman	 Merchant Navy	 United Kingdom	 Tower Hill Memorial	 Panel 64. Age 30. Son of Michael and Annie Donnelly of Drogheda Irish Republic. Robert	 Gray	 50	 13/05/1941	 Chief Electrical Artificer	 Merchant Navy	 United Kingdom	 Tower Hill Memorial	 Panel 64. Age 50. Son of Walter and Annie Gray; husband of Maggie F. Gray of Arbroath Angus. John	 Hale	 51	 13/05/1941	 Chief Steward	 Merchant Navy	 United Kingdom	 Tower Hill Memorial	 Panel 64. Age 51. Son of John Hale and of M. Hale of Over Peover Cheshire. Douglas George	 Millican	 53	 13/05/1941	 Chief Engineer Officer	 Merchant Navy	 United Kingdom	 Tower Hill Memorial	 Panel 64. Age 53. Son of Joseph William and Lydia Caroline Millican; husband of Alicia Millican of Liverpool. William Alex	 Taylor Grant	 24	 13/05/1941	 Second Radio Officer	 Merchant Navy	 United Kingdom	 Tower Hill Memorial	 Panel 64. Age 24. Son of Mrs. B. Taylor Grant of Turriff Aberdeenshire.